The versatile table family Formal and constructive, ORIGIN does not hide its roots. The idea for the frame of the table range ARTUS has subtly been modified and, so to say, "put on its own feet". This way the counter and bar table variants of ORIGIN stand alone, even though the clever proportions of its longitudinal supports appear identical and only the length of the leg differs below the centre crossbeam. ORIGIN comes from KFF's own design department. 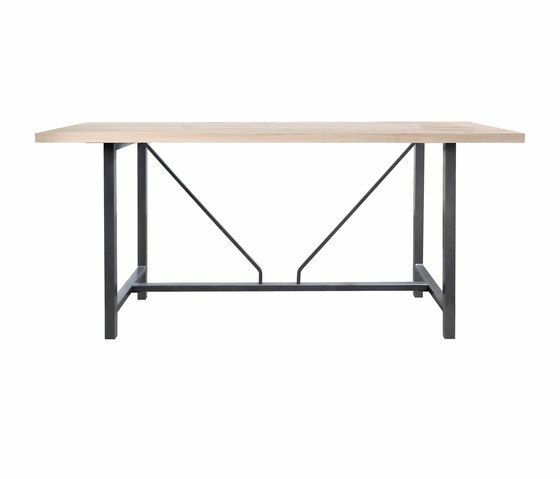 Steel frame and solid wood top are available in numerous dimensions and options, the counter and bar table come in measurements of a fixed 180 x 70/80 cm with a height of 95, respectively 110 cm. 25 Jahre KFF – Eckdaten einer Erfolgsgeschichte Von 1984 bis 2009 – KFF blickt auf eine erfolgreiche Firmengeschichte zurück und in die Zukunft.